A regional daily faces national competition after being nominated for an award for a special sport supplement it produced. The Oxford Mail has been shortlisted in the Special Sports Edition category the 2016 British Sports Journalism Awards, where it is up against titles including the Daily Mail, Daily Telegraph and Sunday Times. 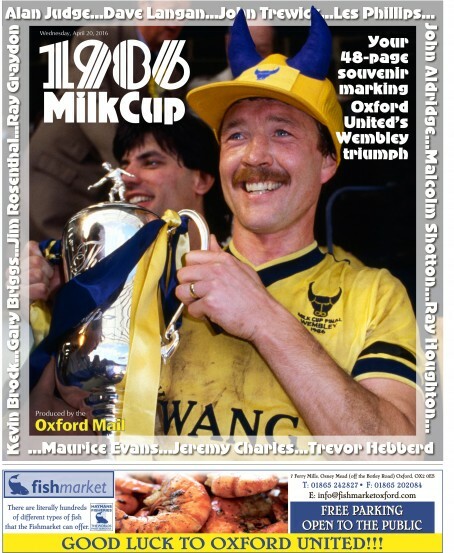 The Mail was nominated for a 48-page supplement it ran in April marking 30 years since Oxford United Football Club won the League Cup, known at the time as the Milk Cup for sponsorship reasons. Five-time winner Jon Colman, of the Cumbria-based CN Group, is up for the Regional Journalist prize, along with NCJ Media’s Mark Douglas, Chris Wathan, of Media Wales, and the Bath Chronicle’s Daniel Evans. Two journalists from London’s Evening standard are also in the running, last year’s winner James Olley and Tom Collomosse. Oxford Mail sports editor Mark Edwards said: “These are massive awards in sports journalism and the calibre of the other newspapers in that category is staggering. The winners will be announced at a ceremony at the Park Plaza Westminster Bridge, in London, on Monday 27 February. Peter Jackson, chairman of judges, said: “Even after all these years, the quality of British sports journalism never ceases to impress me. Its capacity for generating scoops of a global dimension knows no bounds.